This weekend Dracula Untold premiered. Of course, being the Gothic novel and film fan that I am, I had to see it in the theatre. I was highly impressed by the film and would give it 9 out of 10 stars. This film is very much the Dracula movie I have long been waiting for. In my opinion, it is the best Dracula film since Francis Ford Coppola’s Bram Stoker’s Dracula (1992). 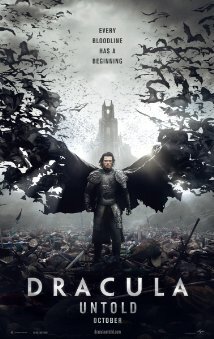 Luke Evans stars as Vlad Tepes in Dracula Untold. Why am I so enthusiastic about this film? Because as much as I love the Bram Stoker novel, the story has never adequately been placed in its historical context in a film—at least not with the vampire aspect included. The only other film I have seen that depicts Vlad Tepes’ story in detail (there may be others I haven’t seen) is Dracula: The Dark Prince (2000) starring Christopher Brand, but that was purely about the historical Vlad Tepes. Dracula Untold goes back to the historical roots of the story while cleverly weaving in the legendary and supernatural aspects of the tale. The result is a superb film with a few historical liberties that I’m willing to overlook for the sake of creating a great fictional story. What is great about the film? First of all, the film is visually a treat for anyone interested in the historical Vlad Tepes. I loved seeing the clothing of the fifteenth century—the colors, the Eastern European and Turkish styles. I loved the castles. I loved not only the monastery but the paintings inside it. I felt like the film was visually very convincing and historical in these respects. The scenery and location were also convincing. I was surprised in the credits to see the film was made in Northern Ireland since it looked like Transylvania to me—I have not been there, but it had the right feel to it. Historically, I loved that Mehmet II and the Turks were part of the story. The historical Vlad Tepes was kept as a boy at Mehmet II’s father’s court as a prisoner, given over by his own father as a hostage. He grew up with Mehmet II, as did Vlad’s brother Radu the Handsome. In fact, I wish the film had given us a scene or two of those years so we could better understand the relationship between Vlad and Mehmet II. For anyone who wants more information on this aspect of the story, I recommend reading Dracula: Prince of Many Faces by Radu R. Florescue and Raymond T. McNally. Of course, everything depicted in the film is not completely historical, but Vlad Tepes had plenty of reason for animosity against Mehmet II. I felt the film did a good job of showing how tyrannical Mehmet could be in trying to control the people of Eastern Europe at the time. While mention of it was not made in the film, Mehmet II is known historically as “The Conqueror” because he defeated Constantinople in 1453, which sent shockwaves to the rest of Europe with the threat that the Muslims might end up wiping out Christendom. Best of all, Dracula Untold depicted how Vlad Tepes became Dracula—the whole purpose of the film, and it does so in a convincing way very much in keeping with the Gothic tradition of committing a transgression deeply tied to a hope for redemption. Previous films have brushed over the backstory of Dracula. Two of the best films with minor backstories for Dracula are Bram Stoker’s Dracula (1992), in which Dracula curses the church because his wife dies while he is fighting the Turks; the curse results in his being punished by being turned into Dracula. Dracula 2000 (2000) depicted Dracula as actually Judas, betrayer of Christ, another fabulous connection that sets up Dracula as an equivalent almost of Satan or as an Antichrist. Dracula Untold owes a bit of a debt to Bram Stoker’s Dracula because of its similar death for Dracula’s wife, which is pivotal to Vlad becoming Dracula, though the events leading to his becoming Dracula, the vampire, occur earlier in the film. When Mehmet II wants 1,000 boys from Vlad’s people to serve in his army, Vlad refuses and goes to a mountain where he understands there is a Master Vampire whose help he seeks to defeat the Turks. This Master Vampire himself has been cursed to be a vampire and reside in a cave in the mountain. He can only be freed if another takes his place. He warns Dracula that if he makes this choice, he will have three days of supernatural powers and then be restored to his regular human form, but if during those three days, he gives into his thirst for blood, he will remain a vampire for all eternity. Dracula, believing he can resist the thirst and wanting to save his people, agrees to this Satanic pact and drinks the Master Vampire’s blood. These Satanic or Faustian pacts in the Gothic are nothing new. The Gothic Wanderer frequently transgresses to obtain forbidden knowledge—as does Dr. Faustus. In this case, though, Dracula does it for a higher cause—he is not seeking the philosopher’s stone to give him fabulous wealth; he is not seeking power for its own sake. He is seeking to be his people’s savior, which makes him a sort of superhero and a Christ figure, an inversion of one who sides with evil to bring about good—a sort of “happy fault” in keeping with Milton’s idea that Adam and Eve’s sin paved the way to bring about Christ’s redemption of mankind to show God’s great love. Dracula becomes a hero because he is willing to make the ultimate sacrifice to save his people. Let us not forget here that most of our modern day superheroes—Batman and Superman among them—have their origins largely in the great supernatural Gothic figures of the nineteenth century, Dracula included. (For more on superheroes’ origins in the Gothic, see my book The Gothic Wanderer.) As the Master Vampire tells Vlad, sometimes it is not a hero but a monster who is needed by people. (And this filmgoer wants more monsters and less superheroes on the big screen.) It is a grand sacrifice Vlad makes, and he has the viewer’s sympathy in making this choice, especially since it is clear in the film that his own people are largely too weak and cowardly to fight the Turks. I completely enjoyed the consequences of Vlad’s decision and watching how and why he ultimately does give into the thirst for blood despite his efforts. What faults does the film have? If we see it solely as a complete film in itself, very few, but if we look at it in relation to the larger historical background as well as the great canon of Dracula literature, we can find a few things that might have been done better or differently. I am willing to overlook the historical flaws for the most part. For example, in reality, Vlad never had a son named Inegras as in the film. Nor did he have a wife named Mirena. Both are fictional characters. Mirena is clearly a play on Mina Harker from Bram Stoker’s novel and adapted from the wife who falls to her death in Coppola’s Bram Stoker’s Dracula, although the cause of her falling to her death is slightly different in this film. For information on the historical Vlad Tepes’ marriages and children, again I refer you to Dracula: Prince of Many Faces. The biggest historical inaccuracy is that Vlad kills Mehmet II. Of course, Mehmet II is the film’s villain so viewers want to see him killed by the film’s hero in the end. In truth, Vlad died in 1476 or 1477 while Mehmet II died in 1481, probably of poisoning. Vlad’s actual death is obscure, but he was killed probably in battle by the Turks. His decapitated body was discovered by the monks of Snagov Monastery near the shore and buried at the monastery. Later, his grave was found open and his body was gone, giving rise to the legend that he resurrected as a vampire. I was a bit disappointed also that the mystery of his death and missing body at Snagov were not brought into the film; instead, another monastery is named in the film, but only as a fortress retreat. My disappointments in the film really aren’t so much disappointments but rather commentary on how I would have made the film differently—I am in the process of finishing my own novel that retells Vlad Tepes’ story, linking it to the Arthurian legend, for my upcoming novel Lilith’s Love: The Children of Arthur, Book Four, intended to be published in 2017. For more information on my novel series, visit my website www.ChildrenofArthur.com. One complaint by the critics is that the film is to be the first in a series of Monster films—a reboot of the classic Universal Monsters films from the 1930s and 1940s that starred Bela Lugosi as Dracula, Boris Karloff as Frankenstein, and Lon Chaney Jr. as the Wolfman—films I have grown to love by watching reruns of them on Svengooli on Saturday nights. Critics are complaining that Universal is trying to capitalize on Marvel’s superhero film franchise. I say let them! There isn’t a Marvel superhero out there who doesn’t pale in comparison to the great Gothic figures. A hint of this upcoming movie series to which Dracula is apparently the prologue is seen in the film when the Master Vampire tells Dracula that some day he will come for him when he needs him. The film ends in the modern day when Dracula meets Mina (clearly Mina Harker from the novel) who resembles his deceased wife Mirena. As they walk off together, the Master Vampire is shown following them and saying “Let the games begin.” I admit I was a bit disappointed here by the modern-day setting and how they meet—it looks like Bram Stoker’s novel will not be recreated for a future film with all its Victorian Gothic grandeur, but skipped over for a modern day story. I don’t think the film was at all clear that the Master Vampire was Caligula—unless I didn’t catch the reference. But I find it fascinating that they will tie in this historical person to the series. I am skeptical about Caligula’s mysterious death, however. I always thought, as most historical sources confirm, that he was slain in Italy by his own guardsmen, and it’s believed he was cremated, so I don’t know where this idea comes from. That said, Caligula is certainly one of the most monstrous humans in history and he works perfectly as a sort of Wandering Jew, a cursed figure who could live for centuries. I’ll be interested in seeing how he is depicted in future films in the series. Go see Dracula Untold. I can’t imagine why anyone would be disappointed. I have read some of the more negative reviews of the film and can tell you those critics know next to nothing about the Gothic tradition. Dracula Untold is not a horror film and it is not an adventure film—it has those elements, but first and foremost, it is a superb and classic Gothic film, and it’s about time a Gothic story is told as it should be with a true transgressive Gothic Wanderer. And better yet, I welcome this recreating of our monsters to be more complex beings. A true Gothic Wanderer is never wholly a villain, but has his sympathetic attributes that allow us to resonate and understand and even cheer him on. Dracula Untold creates such a character superbly.